Sometimes, it seems, waiting is difficult. Like waiting for the next entry in a favourite game series. 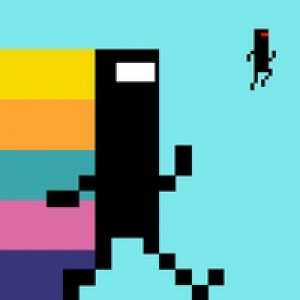 After the last time we parted ways with CommanderVideo in Gaijin Games' phenomenal Bit.Trip RUNNER, the return of the Atarified hero in Bit.Trip FATE seems like it can't come soon enough. Sure, you can bide your time reading our First Impressions of Bit.Trip FATE, and that would indeed take care of stimulating those eyeballs of yours. It seems that now, after a quick trip to CD Baby (as unearthed by Nobuooo), you'll also be able to inject your ears with eight tracks from the upcoming WiiWare game thanks to the release of the game's official soundtrack. Typically the Bit.Trip soundtracks release after the games hit WiiWare, but the opposite is true in this case. Alex Neuse of Gaijin Games said that this was done in part for the sake of doing it different. We decided to release the BIT.TRIP FATE soundtrack before the game because we'd never done it that way before! Our hope is that people will pick up the soundtrack, and start rockin' to the jams so that when they play the game, they'll already have built a relationship with the more somber, darker theme. Also, this soundtrack is really good, and we just couldn't wait to share it with the world. We don't have the final release date for BIT.TRIP FATE just yet, but if I were a betting man, I'd put my potato chips on Oct. 18 for a North American release. Or thereabouts. The soundtrack goes for $6 American. Or thereabouts. The game will be 800 Wii Points. The soundtrack is a very important part of Bit. Trip. OMG!!! RELEASE DATE GOODNESS!!! ... or therabouts. Lol, this has been out for a month now. Catch up, guys! PLEASE BE TRUE PLEASE BE TRUE!!!!! So does this confirm the game will have 8 levels this time around? Corbie said they were Beat (and such...) length and he was at level 4 but didn't know how many there were total. 8 Beat-length levels? Yes, oh yes. Didn't i see the Soundtracks available for all the Bit Trip games on here a while ago? @cnm_nintendo: All the BIT.TRIP soundtracks are on iTunes, but they're more expensive then on CD Baby. Cool, I think I'll pick this up and give my ears a sneak preview! Man, I loved Bit Trip Runner. From the looks of it, this game seems to be awesome!